Depending on your point of view, my title for this article either makes your blood boil, or else you are cheering. Good. Either way, that should keep you reading. A few days ago I noticed a tweet that posed the question of whether or not the states had the right to nullify anti-segregation laws that came from the federal government. That same day, in making an argument for nullification of gun laws, I also used the term right. But it occurred to me later that the term right as it used here is an equivocation – one that contributes to the confusion people have about what rights are, where they come from, what the consequences of violating them are, what states can and can’t do, what constitutions are for, and what law is. The following is meant to clarify all that. The English word law has, as does every other political word, two distinct meanings. One is practical and the other is normative. Putting that in more simple terms – one is law in the sense of a list of rules written up by a group of men – and the other is law in the sense of how things ought to be. Now, the laws that men write down are supposed to be based upon law-as-it-ought-to-be, but they aren’t always. Hence, these two types of law are very different animals. We might also call law-as-it-ought-to-be justice. An understanding of what justice is requires deductive reasoning. Justice is political (i.e., it deals with our relationships to other people) but it is derived from ethics (our relationship with ourselves). Once you have reasoned it out, and assuming there are no mistakes in your reasoning, law-as-it-ought-to-be is certain. That means that it doesn’t change with the times, it isn’t tentative until you have more data, and technology never invalidates it. It is utterly certain. It is, in that sense, the same as 2+2=4. Now, could you say 2+2=5? Yes, you could. After all, you can say anything. But if you really believed that 2+2 was 5, the consequences would be grave. Because you wouldn’t be able to do much else. Maybe you could sit there sucking your thumb, but you couldn’t do anything that required math. And that’s a lot of things. Hence, there are very, very few people who question 2+2. There are rather a lot of people who question nullification, though. And yet, in essence, it’s the same thing. The mistake is not so obvious because the consequences are not so immediate. So let’s look at it. Before we can examine the concept of nullification, we have to know what rights are. I’ve talked about rights many times before on this blog, but it never hurts to discuss it again. A living being, in order to continue to be a living being, has to do certain things. If it doesn’t do those things, it dies. Among those things, for example, is obtaining food and shelter. Because you will die if you don’t do these things, and because it is only you who will ultimately suffer that consequence, you have a responsibility to do them. When these responsibilities are restated from the perspective of a third party (third in the sense that it is not you or yourself) they are called rights. That’s it. That’s what rights are. Now, you can see that rights are not granted by government, right? They are simply a consequence of the fact that you exist and wish to continue existing. If you want to say they are granted by anyone at all, you would have to say they are granted by God. Or nature. Or whatever it is that you believe caused life to come to exist. The Founders called that thing the Creator, but you can call it whatever you want. So you see, if you accept the right to life (and you do if you value your life), all of these other statements, including the right to bear arms, are a lot like 2+2=4. Really, they’re more like 2=2. Now, why don’t states have rights? Now, you could say given the relationship of a federal government to state governments, the states have rights – i.e., they have responsibilities which can be restated from the point of view of another party. Well, that’s true. But there is a problem. States do not have a right to life. Individuals do. In fact, all states really have are obligations. States are created by individuals for a purpose. Beyond that purpose they have no reason for being. In fact, their existence beyond that purpose is detrimental to individuals. But that purpose is so important that individuals are willing to risk it. Ok, so now we can put it all together. The states have an obligation to all of us individuals who are citizens and that obligation is to defend our individual rights. What happens if the state, instead of defending our individual rights, violates them? Ah, there it is. The people have a right to alter or abolish their government. Now, as I’ve said before, and I think you can see from the their writings that the Founders agreed, it does not matter what legislation says. It does not matter what is written in the constitution. It does not matter what is written into law. What matters is only truth. If what is written down does not conform to the truth, the people have a right to disregard, alter, or abolish it. In other words, you don’t have to take the Founders’ word for it, or anyone else’s word for it. You can reason it out yourself. So, why write it down at all? Because not everyone is able to reason it out. In fact, today, unfortunately, the vast majority of people are not able to reason it out. They need a list of rules (law put into practice) to tell them what they can and can’t do if they want to live in a civilized world. If everyone were able to reason correctly governments would be entirely unnecessary in the first place. But they are not unnecessary. And those who are capable of proper reasoning must make sure that the list of rules always conforms to proper reasoning. That means that when you sit on the jury of a man accused of something that is not truthfully a crime (i.e., he did not violate anyone’s rights) you have a responsibility to nullify that legislation. You have that responsibility because if you send a man to prison for something that is not truthfully a crime, you are in fact perpetrating a crime. You are allowing the violation of his rights when you know better. And by allowing his rights to be violated, you have put your own rights in jeopardy. That also means that any state, when another authority attempts to violate the rights of it’s citizens, has an obligation to those citizens to nullify that legislation. In the case of segregation laws, the federal government nullified the states. In the case of gun laws, the states are nullifying the federal government. That’s because back then the states had no business enforcing legislation that segregated people. And today the federal government has no business enforcing legislation that prevents people from defending themselves. Rights are a priori and inalienable. Written law is only a list of rules meant to put into practice a priori law. Nullification is the act of disregarding, altering, or abolishing law that does not conform to proper reasoning (i.e, does not conform to the truth, violates individual rights). Nullification is the responsibility of all citizens of a civilized state. States, that is, governments have no rights. Only people do. Now, when someone tries to tell you that rights are granted by governments, that what is written in the constitution or passed by congress is law, or that nullification is illegal, you will know how to respond. And if someone tries to tell you that “only certain states have the right to secede from the union because only certain states have such wording in their constitutions” you will know that they are very, very mistaken. You can then respond that what is written in constitutions is only relevant if it corresponds with justice. You can tell them that states don’t have a right to secede, because they don’t have any rights. 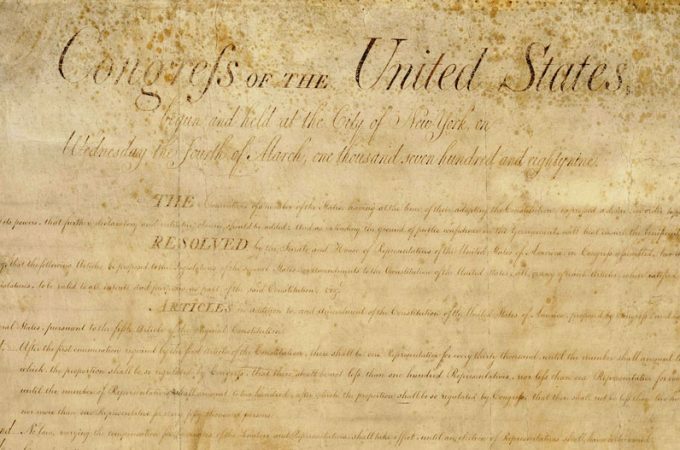 But, if the federal government tries to violate the individual rights of their citizens, the states have the obligation to secede or to nullify. And you can remind them that the state’s sole purpose for existing in the first place is to protect individual rights. Good article. I have a small disagreement, though: in my opinion, all rights are corollaries of one right – the right to property. we own our bodies, and from there all other rights flow.